PI’s new stage is well-suited for industrial automation applications with high demands on dynamics, duty cycles and nanopositioning precision. 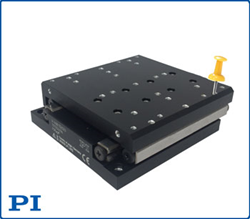 Motion and nanopositioning industry leader PI expands its PIMag® series of high dynamics linear motor stages with a new compact positioner for automation tasks. The new V-408 stage is equipped with an incremental linear encoder for direct position measurement and a high-force 3-phase linear motor drive. The V-408 features high load capacity precision crossed roller elements with anti-creep cage assist, preventing roller creep, and a zero-wear, non-contact linear motor – ideal prerequisites for long lifetime in high duty cycle industrial applications. The high-force linear motor achieves velocities up to 1.5m/sec. An integrated optical linear encoder provides 10 nanometers resolution. The stage achieves 20nm minimum incremental motion and excellent geometric performance with 4µm straightness and flatness. The V-408 is designed to keep cost of ownership and operation at a minimum. Two models are offered with 25mm and 50mm travel range. Integration is facilitated by the compact dimensions with a low profile of only 25mm. The 1” travel model features a square footprint of 80x80mm while the 2” travel model is only 25mm longer. Linear motors provide very smooth motion, and a high dynamic velocity range along with rapid acceleration. They are ideal for scanning applications or automation tasks where repetitive fast start/stop motion with high precision is required and where reliability and maximum uptime are crucial. The V-408 stage can be controlled by PI’s C-891 motion controller and also by ACS and 3rd party controllers.